If the RAZR is to Motorola then the Prism is to Nokia. It seems Nokia has taken a page from Motorola's book and is churning out handsets that looks similar in design. Their new handset, the Nokia 7900 Crystal Prism edition looks every bit the same as the Nokia 7900 Prism previously announced last year. Like what they did with the Nokia N95 8GB, I don't think that Nokia added anything new to the Nokia 7900 Crystal Prism. 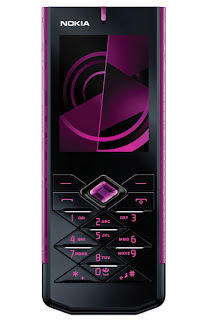 The front face is similar except for the center action button which is black on the original Nokia 7900 but pink on the new Nokia 7900 Crystal Prism. I guess another difference of the Nokia 7900 Crystal Prism is that its aluminum back cover has graphic designs. Other than that, the Nokia 7900 Crystal Prism has the same OLED display, 3G, 2 mega pixel camera, and the living wallpaper. The Nokia 7900 Crystal Prism will be available during the first quarter of 2008 and has a price of 375 Euros before taxes and subsidies.